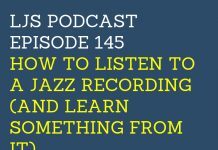 Welcome to episode 163 of the LJS Podcast where today we talk about what to do when you feel un-motivated to practice. Sometimes we are burnt out, sometimes we just don’t want to and don’t have a good reason. It can be confusing especially since deep inside we know we want to become better jazz musicians. Don’t panic, here are 5 things you can do. Tell me if you can relate to me here. If I were to describe myself to somebody else, I would say, “Brent is a husband. He is an entrepreneur. He is a foodie. He likes to travel and he’s a musician”. And music is an important part of my life. It’s an important identifier. I identify myself as a musician. A good percent of my self-worth is tied into being a musician. So obviously, I want to improve as a musician always. But you know, the funny thing is sometimes even when I have ample opportunity to do so, I don’t feel like practicing. I’m un-motivated to practice sometimes and that’s a strange thing- to want to improve but yet not be willing to put in the work to do so. But it’s natural. I’m sure that you can relate to me as well with that. So today I want to talk about 5 things that I do when I feel unmotivated to practice. And it’s probably not everything that you’re expecting. Previous articleShould You Learn Jazz On YouTube? I usually dedicate my Sundays as a get away from your instrument day. So I turn to my first love of RTS strategy or city building games. Since it's a completely different world, it helps! As someone mentioned, definitely documentaries about my favorite jazz musicians. I love the Bill Evans universal mind and inspiration videos from Tim Minchin. Hey Christopher, absolutely! Doing things that have nothing to do with music are great ways to give your brain a break. Great episode. "Reconnecting" with the initial impulse to play, listening to music you like/love, and approaching your instrument with the intention to enjoy it are seemingly such simple ideas, but so easy to forget when we are constantly pushing ourselves to improve, and we lose our sense of joy in playing. Glad you enjoyed it Barry! Indeed! When I feel unmotivated (not burnt out) I build systems for myself in order to do the stuff even if Im not feeling like it. For example yesterday I was really tired and kinda blue so I took a break for the day, but at the end I was like OK I can do a 25m quick session and do the major scale pattern in 4ths I have been working on, all 12 keys in just one session. Then I feel great I accomplished something for the day. I also enjoy a lot reading bios or documentaries about the Jazz greats or fiction jazz movies, that stuff burns me with motivation. Awesome, Daniel! Thanks for sharing.